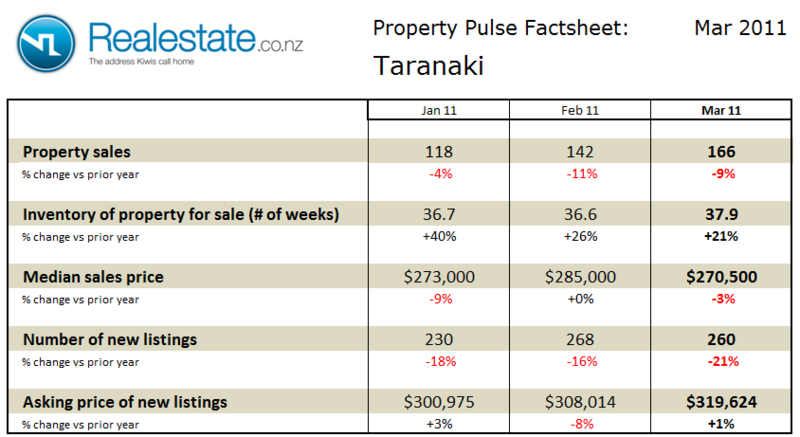 The Taranaki region property pulse factsheet for July 2012 is published using data from Realestate.co.nz and REINZ (Real Estate Institute of NZ). Property sales across the Taranaki region totaled 179 in the month reflecting a significant rise on a seasonally adjusted basis in July and were up 63% as compared to a year ago. At the same time the inventory of unsold houses on the market went up again to 36 weeks of equivalent sales having fallen in June. This sees inventory now well above the long-term average of 27 weeks of equivalent sales. Median sales price of property sold in the Taranaki region at $261,000 was in line with the same month last year and down slightly from the prior month. The asking price expectation of new listings was down 3% as compared to a year ago at $300,680, which represented a rise from the June level of $278,586. The level of new listings coming onto the market in July at 256 was down on the prior month but at the same time up 22% as compared to a year ago. This data indicates that the Taranaki region is quite unstable. Recent sales have been up and down for the past year, although the underlying trend is to growing sales, at the same time levels of new listings are up which has pushed available inventory above the long term average. This leaves the market fairly well balanced between buyers and seller favouring neither significantly over the other, as a consequence price are remaining fairly stable. 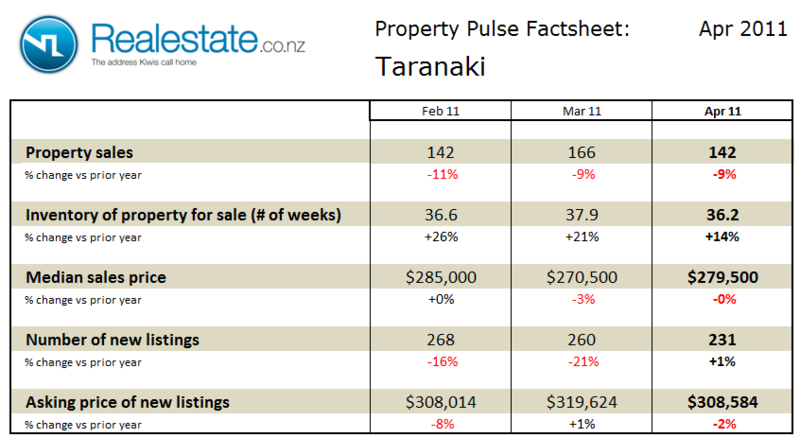 The Taranaki region property pulse factsheet for June 2012 is published using data from Realestate.co.nz and REINZ (Real Estate Institute of NZ). 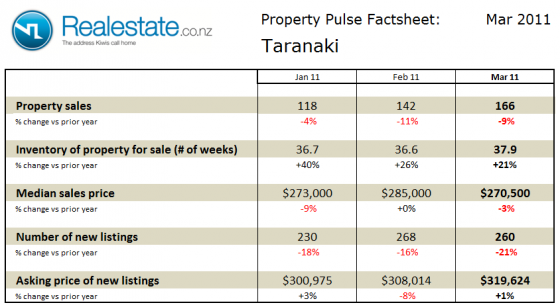 Property sales across the Taranaki region at 136 in the month fell significantly on a seasonally adjusted basis in June and was down 5% as compared to a year ago. The inventory of unsold houses on the market fell sharply to 28 weeks, this leaves the inventory in line with the long-term average of 27 weeks of equivalent sales. Median sales price of property sold in the Taranaki region at $283,750 was up 11% compared to a year ago and up slightly from the prior month. The asking price expectation of new listings was flat as compared to a year ago at $278,586 which represented a significant fall from the May level of $322,645. The level of new listings coming onto the market in June at 270 was well down on the prior month but at the same time down 29% as compared to a year ago. The Taranaki region property pulse factsheet for May 2012 is published using data from Realestate.co.nz and REINZ (Real Estate Institute of NZ). Property sales across the Taranaki region at 226 in the month rose significantly on a seasonally adjusted basis in May and were up 12% as compared to a year ago. The inventory of unsold houses on the market rose markedly to 40 weeks, this leaves the inventory well up on the long-term average of 27 weeks of equivalent sales. Median sales price of property sold in the Taranaki region at $280,000 was up 10% compared to a year ago and up from the prior month. The asking price expectation of new listings was also up 8% as compared to a year ago at $322,645. The level of new listings coming onto the market in May at 339 was up from the prior month and up a very significant 72% as compared to a year ago. The Taranaki region property pulse factsheet for November 2011 is published using data from Realestate.co.nz and REINZ (Real Estate Institute of NZ). 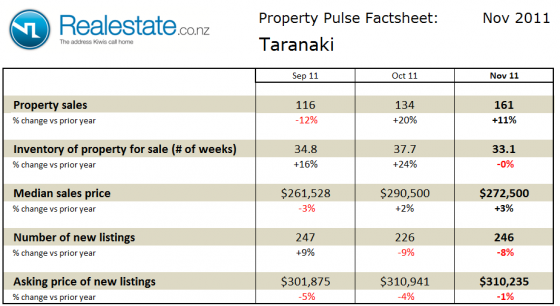 Property sales across the Taranaki region at 161 in the month rose on a seasonally adjusted basis in November and were up 11% as compared to a year ago. The inventory of unsold houses on the market fell markedly to 33 weeks, however it still remains well above the long-term average of 25 weeks of equivalent sales. Median sales price of property sold in the Taranaki region at $272,500 was up 3% compared to a year ago but down from the prior month. The asking price expectation of new listings was down very slightly by 1% as compared to a year ago at $310,235. The level of new listings coming onto the market in November at 246 was up from the prior month and down 8% as compared to a year ago. 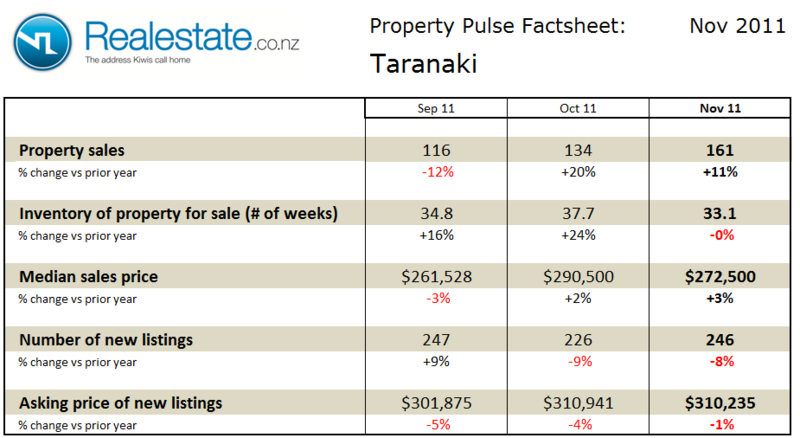 The Taranaki region property pulse factsheet for October 2011 is published using data from Realestate.co.nz and REINZ (Real Estate Institute of NZ). Property sales across the Taranaki region at 134 in the month rose on a seasonally adjusted basis in October and were up 20% as compared to a year ago. The inventory of unsold houses on the market rose to 38 weeks taking it to well above the long-term average of 25 weeks of equivalent sales. Median sales price of property sold in the Taranaki region at $290,500 was up 2% compared to a year ago and up significantly from the prior month. The asking price expectation of new listings was down slightly by 4% as compared to a year ago at $310,941. The level of new listings coming onto the market in October at 226 was down from the prior month and down 9% as compared to a year ago. The Taranaki region property pulse factsheet for May 2011 is published using data from Realestate.co.nz and REINZ (Real Estate Institute of NZ). Property sales across the Taranaki region at 201 in the month rose significantly on a seasonally adjusted basis in May and were up 20% as compared to a year ago. The inventory of unsold houses on the market fell slightly to 35 weeks to remain well above the long-term average of 25 weeks of equivalent sales. Median sales price of property sold in the Taranaki region at $255,000 fell by 7% as compared to a year ago and was also down from the prior month. The asking price expectation of new listings was down 9% as compared to a year ago at $292,077. The level of new listings coming onto the market in May at 197 was down from the prior month and down 4% as compared to a year ago. 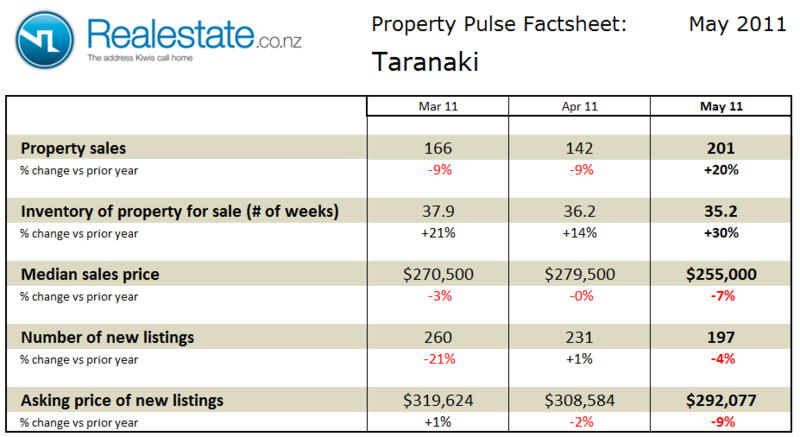 The Taranaki region property pulse factsheet for April 2011 is published using data from Realestate.co.nz and REINZ (Real Estate Institute of NZ). 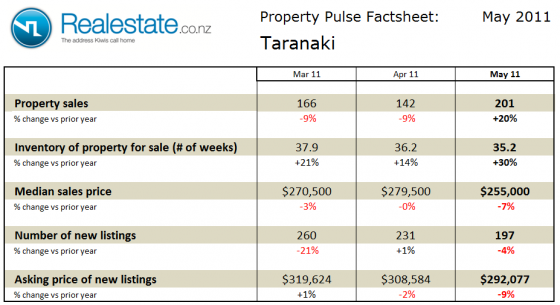 Property sales across the Taranaki region at 142 in the month barely moved on a seasonally adjusted basis in April but were down by 9% as compared to a year ago. The inventory of unsold houses on the market fell slightly to 36 weeks to remain well above the long-term average of 25 weeks of equivalent sales. Median sales price of property sold in the Taranaki region at $279,500 was flat as compared to a year ago and up slightly from the prior month. The asking price expectation of new listings was down slightly by 2% as compared to a year ago at $308,584. The level of new listings coming onto the market in April at 231 was down from the prior month and up just 1% as compared to a year ago. 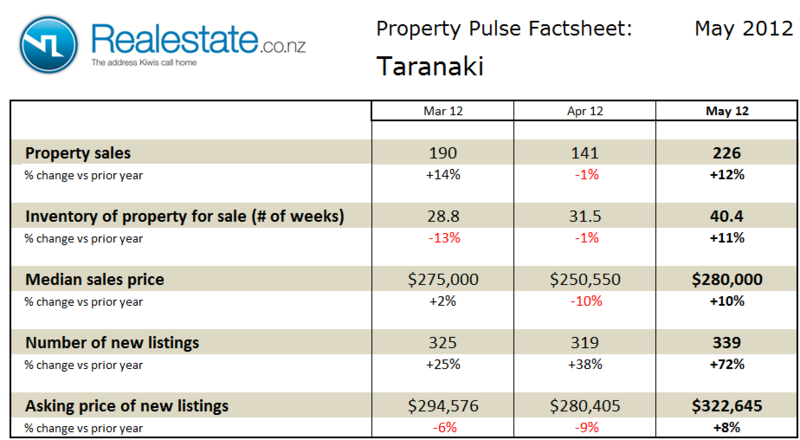 The Taranaki Property Market factsheet for October 2010 can be downloaded by clicking this icon. Property prices in Taranaki recovered somewhat in September to $269,500 from $265,500 in August. As compared to a year ago prices in the region are down by 4.8%. Property sales in the region dipped by 12.1% in September on a seasonally adjusted basis. A total of 132 properties were sold in September. Over the course of the first 9 months of 2010 a total of 1,336 properties have been sold compared to 1,513 in the same period in 2009. The inventory of houses on the market remains at high levels with 30 weeks of equivalent sales in September. This inventory of 30 weeks of equivalent sales continues to be well above the long term average of 22 weeks. This would indicate that the market still favours buyers. 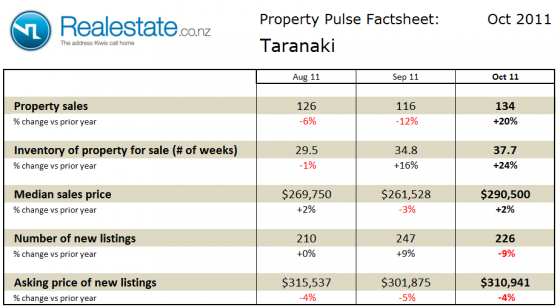 The Taranaki region Property Market factsheet for August 2010 can be downloaded by clicking this icon. 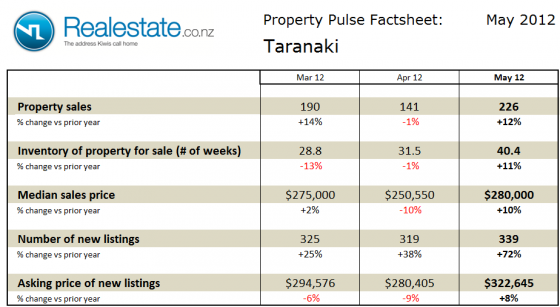 Property prices in Taranaki rose again in July to $292,000 from $285,000 in June. As compared to a year ago prices in the region are up by 4.2%. Property sales in the region rose by 15% in July on a seasonally adjusted basis. A total of 145 properties were sold in July. On a moving annual basis sales are down 2% with 1,852 sales in the past 12 months compared to 1,890 in the prior 12 months. Inventory of houses on the market spiked up again to 32 weeks of equivalent sales in July, equaling the peak of April this year. This July inventory of 32 weeks of equivalent sales continues to be well above the long term average of 22 weeks. This would indicate that the market still favours buyers.